Most of the people use to expend time in the balcony for getting fresh air and to have a look at the outdoor activities. In fact, sometimes individuals sit on the balcony to esteem the beauty of nature in the night. 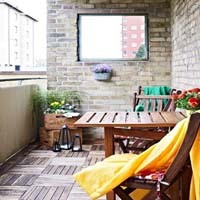 Hence, one should need to add some style to the balcony for making the place more appealing for spending quality time. Using stylish wall tiles turn the balcony into inviting and modern outdoor rooms. You will find different and unique style wall tiles at the MyTyles online store. A wide range of tiles which offers classic and modern look to your home are available here.